The KR-9400 is rated 120 watts per channel @ 8 ohms. This unit has no problems driving any speaker to room-shaking levels. The AM/FM tuner is one of the best available. This unit has been checked out and sounds excellent! It has a great 3-way tone control section with bass, mid, and treble controls. 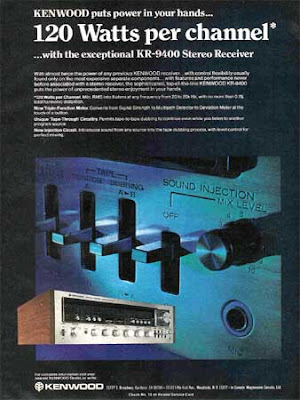 It is equipped with two phono inputs, two tape loops, an auxiliary input, and a microphone input. Our tech has cleaned and lubed all of the pots and switches so that everything sounds like new. It is a large and heavy receiver. It measures 21" x 18" x 7" and weighs 44 lbs. This one will not sit around for long so call us..